Strawberry season is upon us! From mid March through June 1st, sweet and succulent strawberries will be at their peak and plentiful in grocery stores, farmer’s markets and pick-your-own farms. Strawberries are not just another pretty face. They are considered a superfood, loaded with valuable health benefits. They are chock full of vitamin C, which helps boost the immune system. 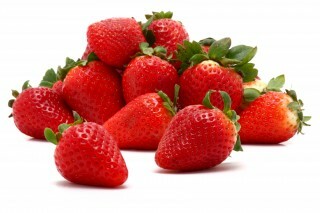 Strawberries also are high in antioxidants, which helps in the prevention of cancer and heart disease. The antioxidants present in strawberries can help reduce joint inflammation, which is good news for those who suffer from arthritis. Strawberries also contain fiber, which is important for healthy digestion and fighting Type 2 Diabetes. Strawberries start to lose their Vitamin C and antioxidants after just two days storage time. The best scenario is purchase and consume them when they are in season and within a few days of purchase. They are still edible and still provide health benefits when stored longer than the recommended period, just not as much. The best place to store strawberries is in the refrigerator and because they require higher humidity, it’s best to store them in a cold storage bin. Strawberries should not be washed until right before eating or using in a recipe. Gently wash the berries, pat them dry and then remove the cap and stem, which prevents extra water from absorbing into the berry. Want a quick and easy dessert? Try drizzling them with a high quality balsamic vinegar, such as our traditional dark balsamic vinegar or for a chocolate twist, drizzle with our dark chocolate balsamic. The berries and vinegar can be served solo or over vanilla ice cream, shortcake or brownies. Chef Melissa has created a super simple vinaigrette using our Aged Strawberry Balsamic Vinegar. Be Healthy and Eat More Strawberries!